Hassled CEOs have no other option but to keep issuing guidelines from one quarter to the next without fail. Much in tandem, every quarter, a new corporate scam hits the headlines. The precise regularity with which skeletons keep tumbling out of corporate closets at frequent intervals would put the atomic clocks on our planet to shame. When it comes to perpetrating a fraud on unsuspecting stakeholders, human ingenuity has never been found wanting. If America had Enron and Lehman Brothers, UK had Barclays. If Norway had Nortel, Portugal had Banco Espirito Santo. If Switzerland had UBS, Germany had Volkswagen. India has had Satyam and Punjab National Bank. She has also earned the dubious distinction of improving upon its Ease of Emigration rank for defaulting high net worth individuals in the recent past. No industry could lay a specific claim on such man-made disasters. Be it banking, insurance, mining, automobiles, liquor, energy, commodities, IT or real estate, all have set examples of devious plans to deceive their stakeholders, whether of the gullible kind or the colluding kind. Human greed and avarice are obviously the root cause. The sheer pleasure derived by a minority in making some extra gains at the cost of a silent majority apparently has a sense of gratification which surpasses all else. A business environment of this nature needs leaders and managers who have nerves of chilled steel and a disposition backed by a high degree of inner resilience. A deep commitment to values and ethics in business. A premium on fairness and transparency in all kinds of deals. A long-term view of sustainable success, as opposed to a fly-by-night approach to decision-making. A constant connection with one’s inner self. In short, they need to have a high Spiritual Quotient. 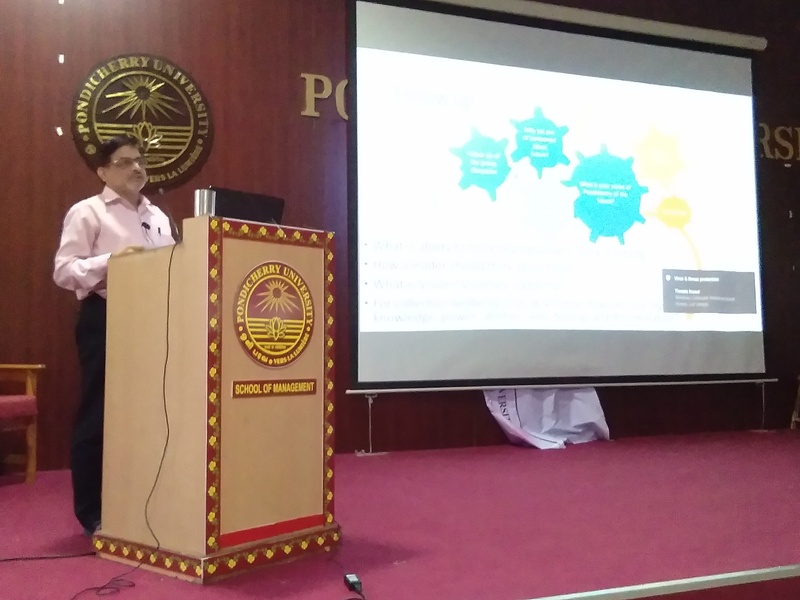 The Department of Management Studies of Pondicherry University, in collaboration with Sri Aurobindo Centre for Advanced Research (SACAR), recently conducted a two-day workshop, highlighting the manner in which aspiring managers can work on an inner transformation and achieve unparalleled satisfaction and growth in their careers, whether as professionals or as individuals. 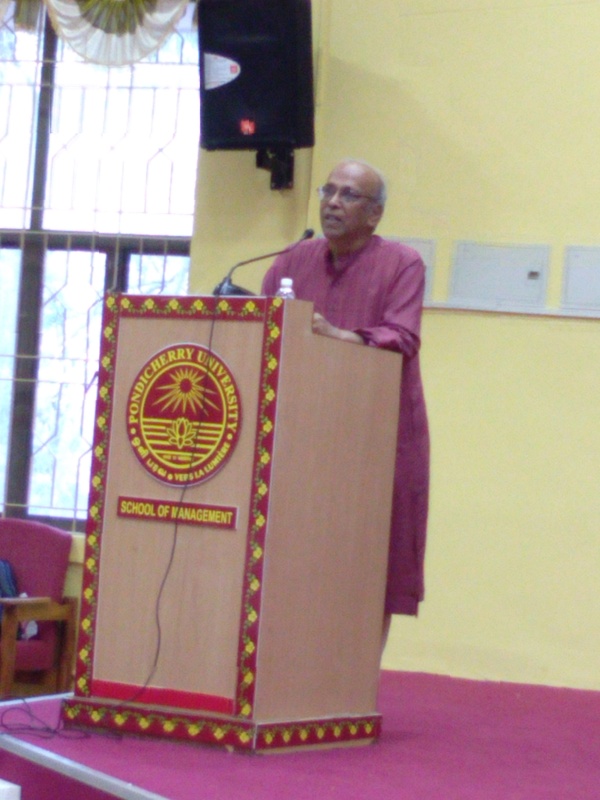 In his keynote address, Dr Ananda Reddy, Director, SACAR, highlighted the challenge the leaders and managers of today face: that of following values and ethics in business, of imbibing the principles of corporate governance in their decision-making, and the need for being aware of the potential of spiritual consciousness as a solution to the problems they face. Organizations are made up of human beings. Thus, the mantle of transforming corporates falls squarely on the young and strong shoulders of individual leaders and managers. This alone can lead to a meaningful evolution in the manner in which organizations function. By being an important part of society at large, such organizations set high standards and spearhead social evolution. The need of the day is to view the management process through a new lens – that of the Four Pillars of Harmony, Strength, Perfection and Wisdom. This new paradigm of Management goes beyond the self-centred ‘I and Me’ approach of Western models. Rather, it focuses on the overall good, espousing a ‘We and Us’ approach, which is more holistic in nature. 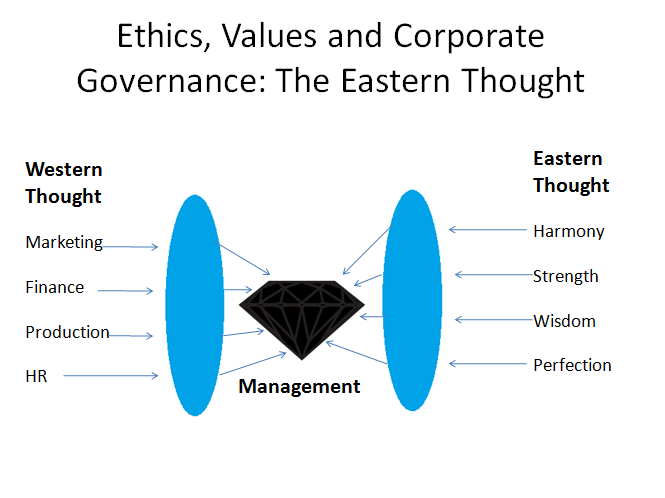 This new paradigm is based on ancient Indian wisdom and can help leaders and managers to deal with corporate affairs more effectively and efficiently. 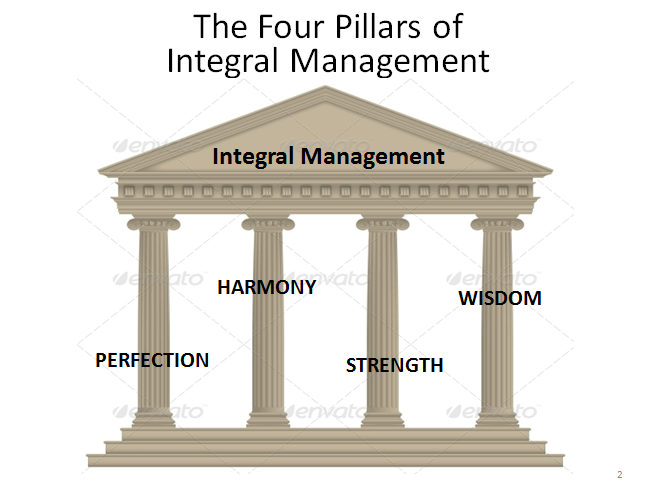 Yours truly provided to the participants an overview of the Four Pillars of Integral Management, backed by real life examples from the business world. The challenges of maintaining Harmony were brought up, as also the need for a higher Spiritual Quotient. Use of planned disharmony in the market place, as evidenced by the disruptive entry of Reliance Jio in the telecom sector and that of Patanjali in the FMCG sector, was mentioned. The need to deploy Strength for the overall good was substantiated by the case of Tata Trusts. The abuse of corporate muscle power was brought out by quoting the case of Erin Brockovich, who spearheaded the campaign to secure substantial relief for those who suffered at the hands of the Pacific Gas and Electric Company of California in 1993. The development of hybrid cars and several product recalls were cited as examples of dynamic Wisdom in company’s policies. The need to build brand equity was discussed, so was the role of intuition in decision-making. The story of how the Indian Institute of Science at Bangalore came up based on the singular initiative of Sir Jamsetji Tata (1839-1904) was narrated. Participants were exhorted to give up the culture of mediocrity and strive for Perfection in all their actions. Example of Apple products and Rolls Royce cars were cited. Professor Kisholoy Gupta, an accomplished international trainer in Management Sciences, based in Bangalore, invited the participants to play some games to demonstrate the role and importance of Harmony and to experience a freedom of expression, so one could feel free and happy, and therefore, work more productively. Ms Padma Asokan, who manages Omeon Solutions, a global software company in Chennai, explained the need and mechanics of achieving Harmony in organizations. The core of any organization being love and harmony, managers can improve their contribution by achieving a balance between their inner and outer selves. Managements need to enable harmony at different levels. At the infrastructure level, care needs to be taken of tools, office layouts, work station design, and rest and recuperation facilities. The top person is the DNA of the company’s culture and thereby enables organizational harmony. Operational harmony is achieved through teams which aim to achieve success in whatever they choose to do. Smooth communication, whether vertical or horizontal, ensures better harmony across an organization. Treating employees with respect and dignity and innovative HR policies ensure a high degree of motivation at all levels. Order and cleanliness attract all stakeholders to a business. Waste reduction, productivity improvement and minimal friction are the key benefits one derives. The highest form of harmony results from conflict resolution of values across individuals, departments and profit centers. Managements keen to achieve a state of sustainable corporate harmony counsel their employees to cleanse their minds of such negative emotions as anger, hatred, passion, lust, delusion and pride. 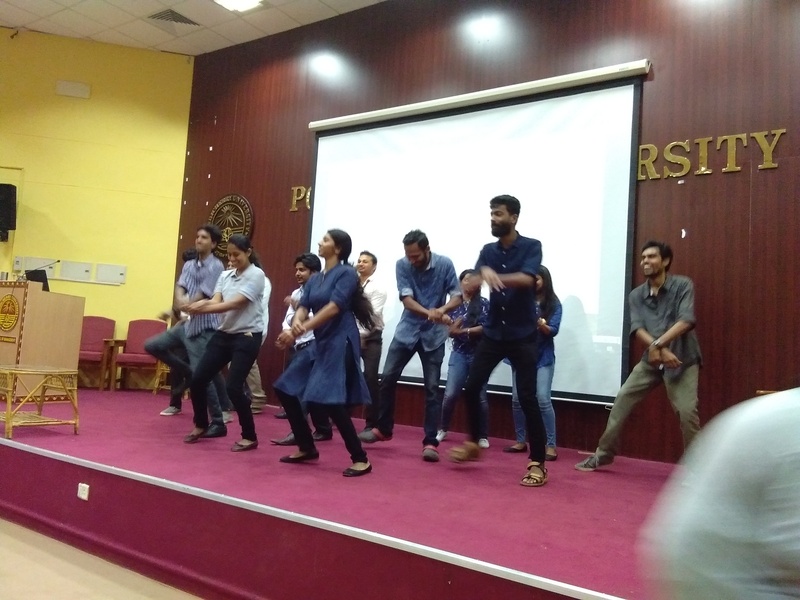 Professor Kisholoy Gupta conducted some practical exercises to make the participants aware of the importance of the Strength of being impartial and objective and “stepping-back” before taking any decision. 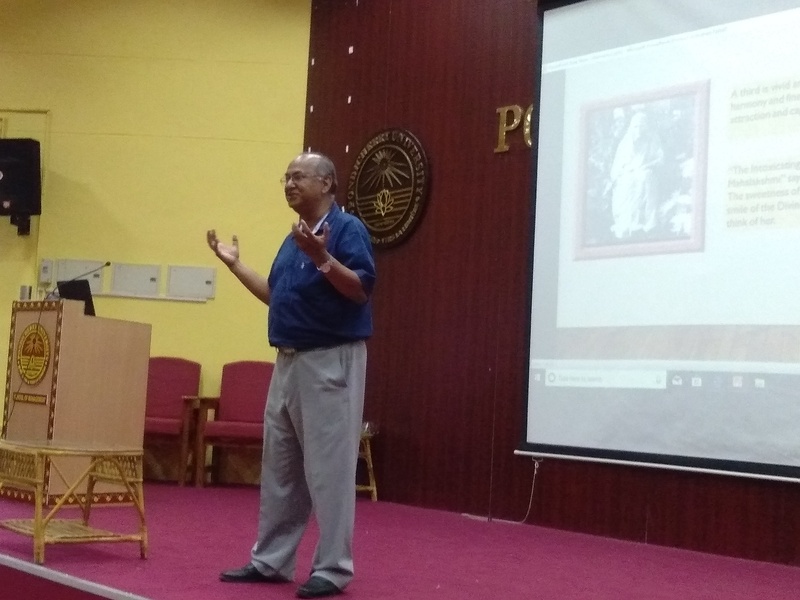 Mr Ganesh Babu, a strategic thinker and a coach extraordinaire based at Pondicherry, touched upon the importance of self perception, self-control and a belief in one’s own abilities. By quoting examples of several spiritual stalwarts in the fields of business as well as in spirituality, he demonstrated that it was their belief in themselves and their unique capabilities that led them to scale great heights and become the leading lights of humanity, inspiring one and all. An individual manager’s values and beliefs shape his attitude. These, in turn, determine his feelings and behaviour, making him what he is. The power that he exercises is often derived from his beliefs. By reviewing one’s belief systems, one can enjoy greater power over one’s actions and circumstances, thereby enhancing one’s efficiency and effectiveness. -Dealing with Materialistic Resources in a firm and polite manner. 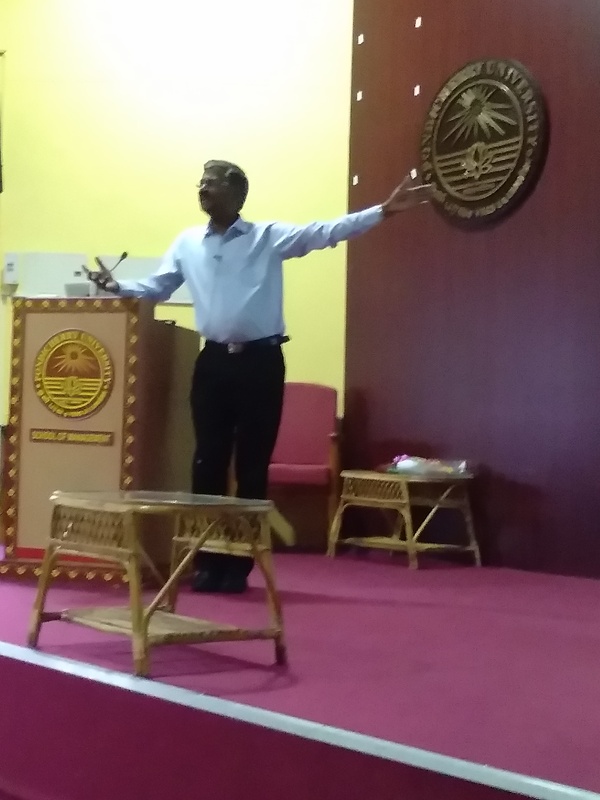 Professor Kisholoy Gupta conducted a series of practical exercises of making quality products, thereby driving home the relevance of Perfection in management. 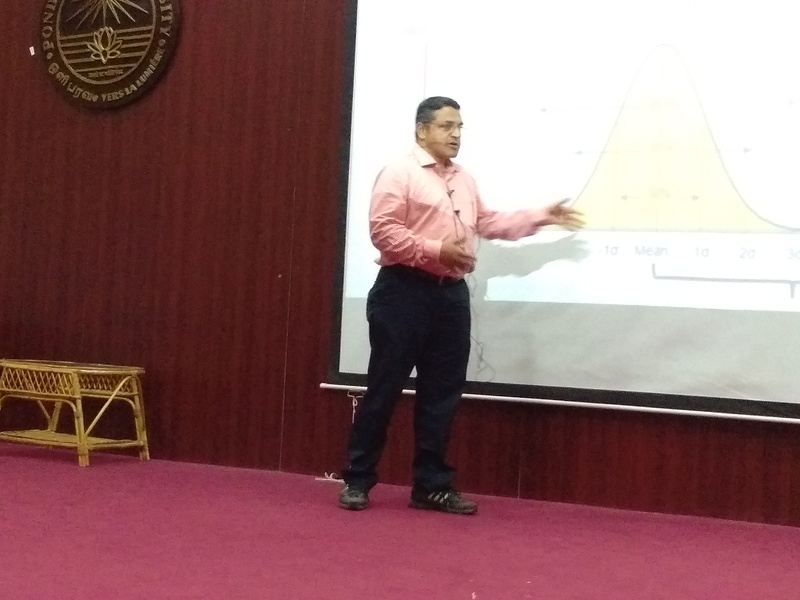 Dr Sridarshan Kaundinya, having had cross-functional experience in such companies as GE, Indus and TCS, and presently based in Bangalore, explained the manner in which Perfection gets practiced in the industry. The need to go for quality levels far beyond Six Sigma, like in aircraft engines where a failure could directly lead to loss of precious human lives, was touched upon. Perfection is not only about having an intuitive power to accuracy but also about an unfailing attitude of fulfilling commitment, of being unscrupulous, unsleeping, indefatigable, and touching every detail, and of organizational execution and achieving an unfailing exactitude of result. By way of a warm-up exercise on Wisdom, participants were invited to describe the lines along which the city of Pondicherry should develop in another decade or so. Brighter minds at the workshop came up with some lofty and pragmatic goals for the city planners and administrators. Dr Narendra Joshi, an eminent educationist from Mumbai, who has also worked on the interface between Artificial Intelligence and Spirituality, described Wisdom as comprising vision, wideness of understanding, and as a result, an endless compassion and patience for the time needed to effectuate and implement the intention of the Supreme in the manifestation. He stated that it is not uncertainty alone that has paralyzed CEOs today. Many find it difficult to reinvent their corporations rapidly enough to cope with new technologies, demographic shifts, and consumption trends. They’re unable to develop truly global organizations that can operate effortlessly across borders. Above all, leaders find it tough to ensure that their people adhere to values and ethics. One way of describing Wisdom is to have the ability to see the trees and the forest at the same time. With meditation and an inner connection with oneself, this can be cultivated. 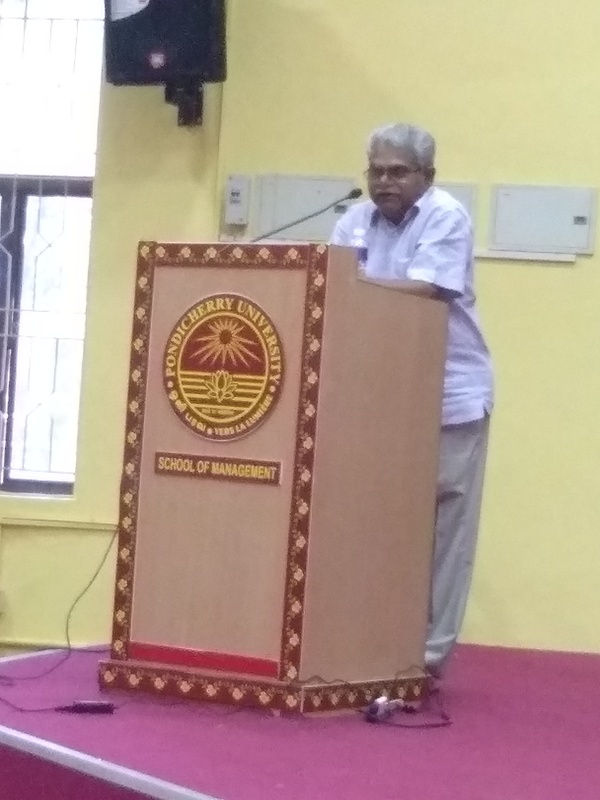 Mr. N Harihara Subramanian, a passionate Social Worker involving and supporting many Projects and a founder and promoter of the Indian Institute of Governance (IIG), Chennai, delivered the Valedictory Address. He exhorted the participants to propel their organisations beyond traditional norms of Corporate Social Responsibility, and work for the overall benefit of the communities surrounding them. 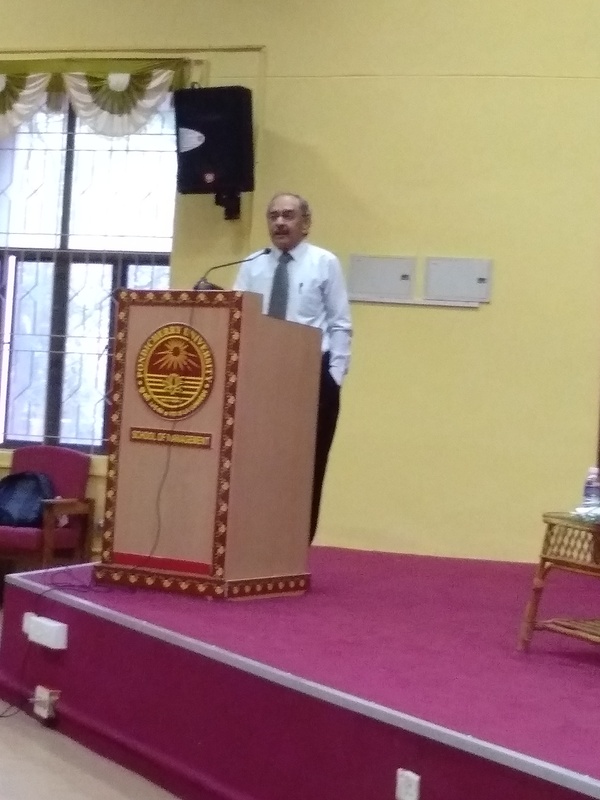 Dr Ananda Reddy, Director, SACAR, summed up the proceedings of the workshop. He reiterated the need to train young managers not only based on the Western models of management, but also to draw deeply from the wisdom contained in Indian scriptures. This alone could lead to businesses which work for the overall good of the society. The workshop was designed to develop the inner capabilities of students as future managers in terms of the aforesaid Four Pillars of Harmony, Strength, Wisdom and Perfection. 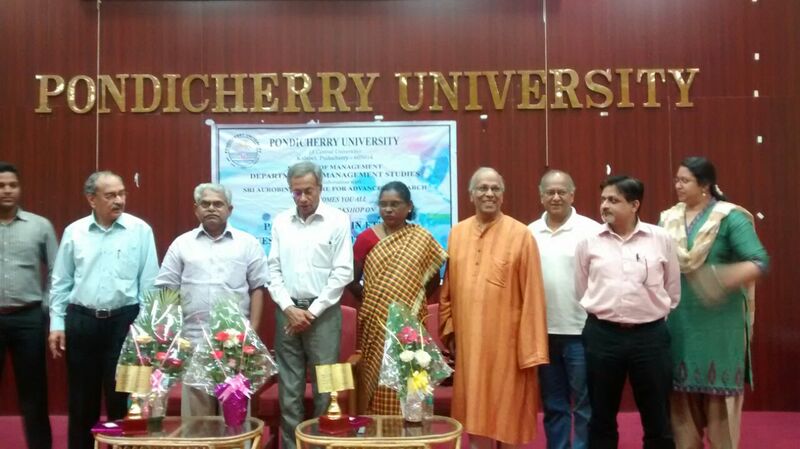 The event was chaired by Dr. G. Anjaneyaswamy, Professor and Dean, School of Management, Pondicherry University. 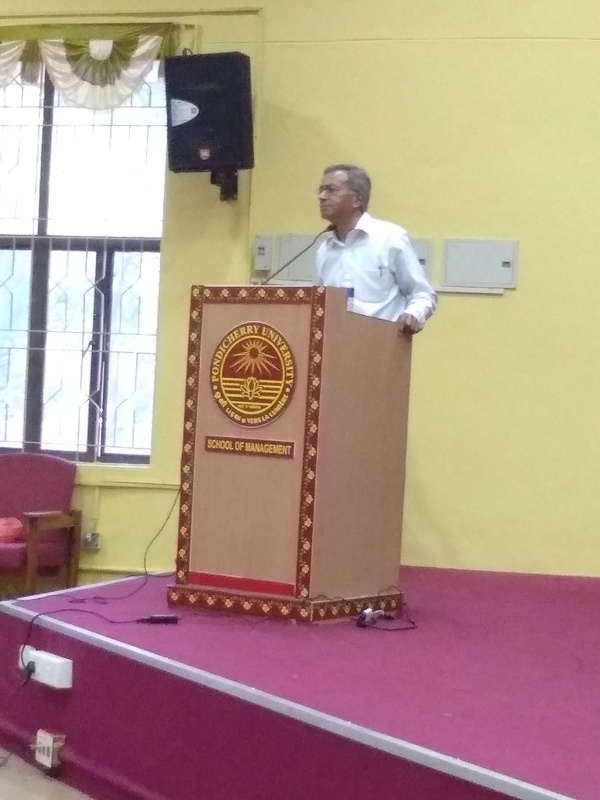 In his concluding remarks, he appreciated the unique contents of the workshop and expressed a hope that the Department of Management Studies may like to have the same incorporated into the formal syllabus of a regular MBA course at Pondicherry University. 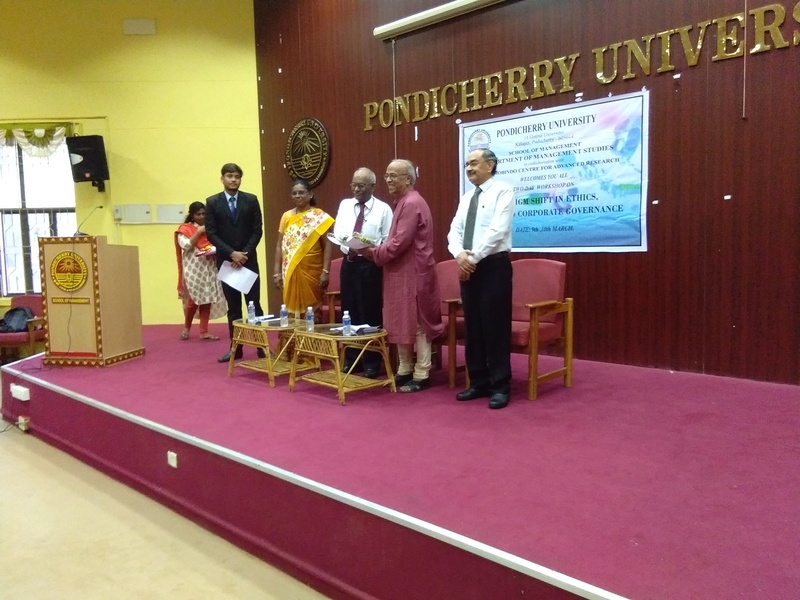 The Inaugural Session was chaired by Professor K C S Rao, Head, Department of Banking Technology, School of Management, Pondicherry University. 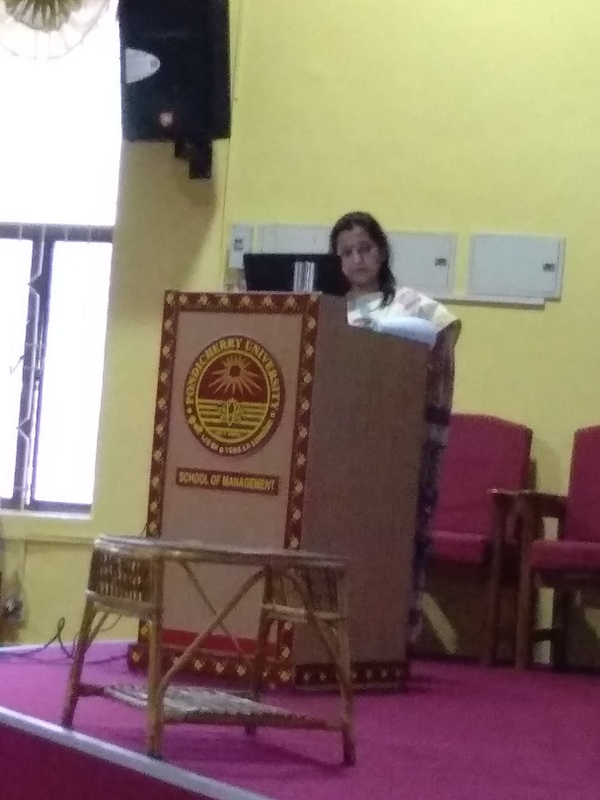 The Convener of the workshop was Dr. R. Chitra Sivasubramanian, Professor & Head, Department of Management Studies (DMS), Pondicherry University. 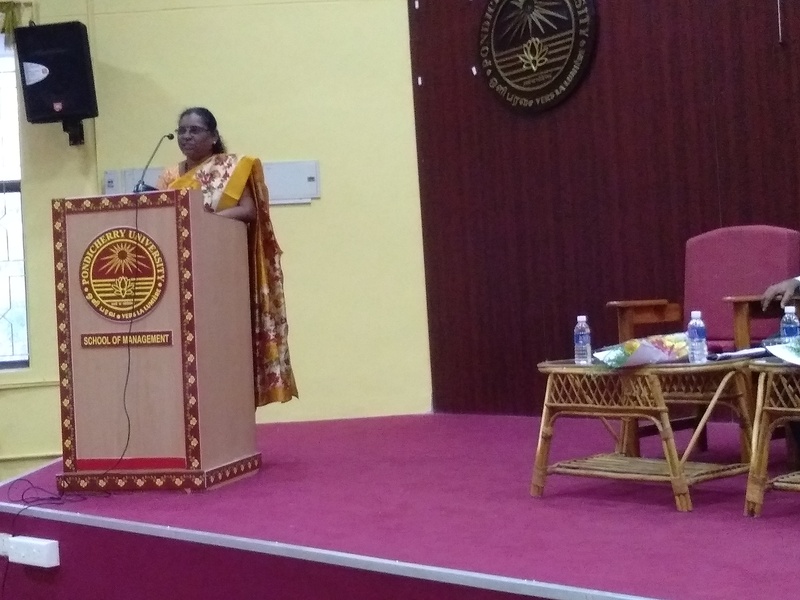 The entire event was coordinated by Dr. B. Rajeswari, Assistant Professor, and Dr. R. Venkatesakumar, Assiociate Professor, DMS, School of Management, Pondicherry University. Dr Shruti Bidwaikar was the main coordinator from Sri Aurobindo Centre for Advanced Research (SACAR), Pondicherry. Businesses with a futuristic vision need managers who are not only tech-savvy but also situation-savvy, adept at handling stressful challenges with ease and aplomb. SACAR is open to the prospect of conducting similar workshops in commercial organizations as also at management institutes of repute, whether for the students or for the faculty. For institutes interested in incorporating the content in their regular management courses, a draft syllabus has also been prepared under the guidance of Professor G P Rao, who, after retiring from Madurai Kamaraj University in 1997, has devoted himself to the mission of spreading human values in organizations, through his NGO, SPANDAN. The very mention of Naushad’s name brings to our mind this genius composer’s heartfelt and melodious compositions steeped in Indian ethos and transports us to a magical era when music reigned supreme in our films and meaningful lyrics added beauty to these tunes. Naushad had tremendous knowledge of Indian classical music and could play several musical instruments and to him goes the credit of pioneering a unique style wherein he brought Indian classical ragas into popular film music. He also added a touch of folk music to his songs and being a poet himself always gave importance to lyrics. All these gave his songs a unique edge and set him apart from his contemporaries. 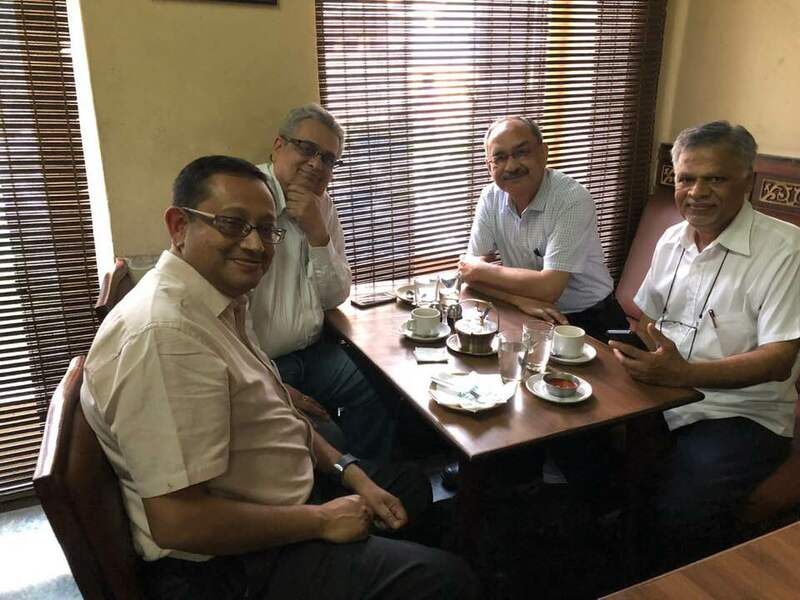 When The Egg, The Bean, The Crumpet and The W-and-Soda ended up meeting each other in Bangalore recently, they met at Koshy’s, an iconic hangout joint in the no-longer-as-green-a-city. 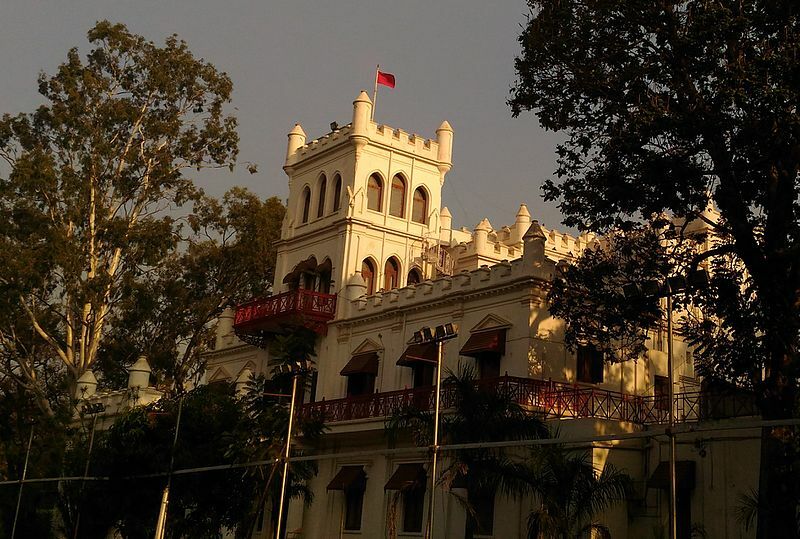 Visited in the past by such illustrious figures as Pandit Jawaharlal Nehru, Queen Elizabeth II and Nikita Khrushchev, the place proved to be classy, sporting a stiff-upper-lip dispensation, generally brooking no nonsense. 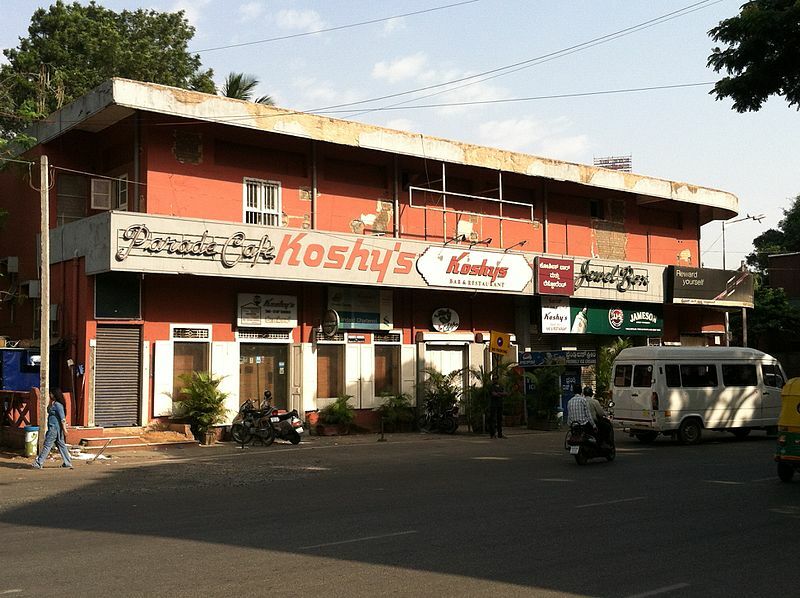 The management of Koshy’s does not encourage guests to throw bread crumbs at each other. The reasons are not far to seek. One, they make their own bread, thereby looking askance at any attempts to denigrate the same in any way. Two, their clientele comprises the kind of intellectual coves who despise any show of what, in their jaundiced view, would amount to a dash of frivolity. In order to ensure strict compliance with this code of theirs, they ensure that the sandwiches dished out by them are made up of bread which does not boast of a crisp crust at the edges. Also, the sandwiches are so very delicious that the mere thought of wasting even a residual scrap would not enter the minds of those who devour them. The ambience at Koshy’s is otherwise vibrant. The decibel levels are on the higher side, thereby prompting all those who are there to engage in lively conversations with each other. This in turn ensures that smart phone addiction is kept under a strict check. Also, guests at nearby tables cannot hope to listen in when one of the residents of Plumsville decides to either sing Sonny Boy or replicate the Market Snodsbury speech of Gussie Fink Nottle. Waiters of all hues, sizes and shapes hover in the background, serving the guests with alacrity and servitude. They also appear to be well-trained at thwarting any attempts at throwing boiled eggs at the ceiling fans merrily whirring above. The Egg happened to be in the city on a business errand, discovered that a Plummy meet was in the offing on the day, and decided to walk in. The Crumpet was on his way from India to Norway and was keen to meet others in the fans club. Both of them arrived early and lost no time in discussing the reasons underlying the popularity of the works of P G Wodehouse. The Bean and The W-and-S, both residents of the city, walked in soon enough, mopping their brows after having braved the challenging traffic conditions of the metropolis. The Bean, a real estate magnate, regaled all others with his unique sense of humour. He regretted having missed out on a similar gig in the City of Joy some time back, owing to Fate having struck him with a lead pipe very close to the event. The W-and-S, a business strategy expert, occasionally butted in with his intellectual comments, thereby spicing up the proceedings. He also narrated personal experiences from his life which keep him connected to Plum. The Egg described in detail as to how a stern lion tamer built along the lines of Miss Mapleton was responsible for his discovery of the blissful world of Plum in his earlier school days. The Crumpet expressed his desire to enable more of the younger lot to get introduced to the joys of reading Plum. He and The Egg recounted their Plummy encounter in New Delhi during November 2017. Regrettably, attempts at any display of chivalrous tendencies by those present were rendered impossible, since two of those of the so-called delicately nurtured tribe, who were expected to show up, decided to accord higher importance to their familial responsibilities. The Gin-and-Tonic was busy elsewhere, fussing over her ailing mother. The Watermelon Vodka was attempting to strike a finer balance between her work and home life. The feudal spirit reigned supreme on the day. The future offers far richer possibilities. The Jayamahal Palace Hotel is another favourite haunt of the Bangalore Plummies. Often, other residents of Plumsville keep trooping in from the City of Joy and elsewhere, thereby providing an excuse to Plum’s fans in the city to take some time off from their mundane chores and wade in Plummy waters, uplifting the spirits dulled by a relentless pounding by the harsh slings and arrows of Life. Here is a juicy description of what transpired at the last Plummy Convention in the New World, from someone whose guardian angels have conspired to bless him with a grandson (very aptly named Clarence) who shares his birthday with Plum himself. Now where was I? * Oh yes . . . The Wodehouse Society convention in Washington DC, way back in October . . . hmmm. It was a big couple of days and I’ve tried to capture them in verse, given that’s less typing. My excuse for not expanding on the topic in my usual wordy way is that the doggerel ate my homework. No really, thank you, the applause is too much . . .
as The Stepper hove into view. just to be clear, what again? Bhupinder Singh’s priceless contribution as a guitarist in Hindi film songs! Most people may not be aware that singer Bhupinder Singh loved for his soulful ghazals and memorable songs from films like Gharonda, Mausam, Thodi Si Bewafai, Kinara, Parichay, Aitbaar, Bazaar, etc., is also an expert guitarist and has composed some of the most memorable guitar pieces ever heard of in Hindi cinema. Born in Amritsar it was destiny that dragged him first to Delhi and then to Mumbai where he became very popular as a playback singer and ghazal singer thanks to his unique resonating voice. However the guitarist in him never came to be publicized much and this humble man always put in his best and just let his work speak for itself. Fans of P G Wodehouse can be found all over the world. When they decide to meet up once in a while, bread crumbs get thrown. Different versions of Sonny Boy get rendered. The Gussie Fink Nottle speech at Market Snodsbury School gets recreated. Characters and situations get discussed gleefully. The milk of human kindness flows unabated. Flowers bloom. Sanity regains its throne in one’s mental framework. God takes some time off his onerous responsibilities and relaxes in heaven. All is well with the world. During 2017, yours truly was fortunate to have had some such Plummy encounters. The video here recapitulates the same.